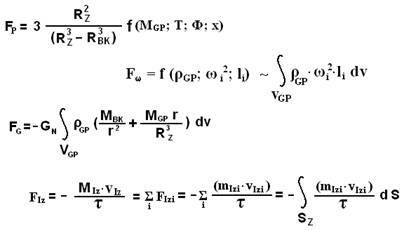 We have deduced the thermodynamic equation of star existence (5.20). Let’s generalize the processes which are occurring in stars that were established as a result of concluding the equation (5.20). – In the star, under action of dynamic processes, there is a synthesis of kernels of atoms, and in the star’s kernel, «the white dwarf» is being formed. From the star’s surface energy is being allocated in the space, in the form of «solar wind», radiations and electromagnetic waves radiations. – The gas-plasma mix – the basic fuel source of the star. – A gravitational force from two sources operates on a gas-plasma mix in the star – «the white dwarf» and the gas-plasma mix itself. It is possible to represent change of the mass of the star, «the white dwarf» and the gas-plasma mix of a star during the life period can presented presumably theoretically, on the schedule in figure № R-5.6. (19 g/sm3) and plutonium (19.82 g/sm3). The high density of a matter in the star’s kernel, states about the presence of heavy and over the heavy atoms, which are situated at the end of a periodic table of elements. There is a high probability of synthesis in stars of heavy atoms beyond the aisles of the periodic table, whose existence is possible only in the conditions of stars. Unknown spectra of atoms of neutron stars probably show on this fact. And the Sun has unknown spectra of atoms. – The high speed of the solar wind is a result of thermonuclear synthesis of kernels in the top layers of the star’s atmosphere. The main reason for the high speed of the solar wind is the impulse received as a result of thermonuclear synthesis. Comparison of the high-speed characteristics of synthesis products and their chemical compound states that «the solar wind», is a stream of particles, and the kernels received as the result of nuclear reactions in the external layers of the Sun, and not the interaction of charged particles with the magnetic field of a star. Though, it is possible that the magnetic field influences the speed of particles stream. – If the equation (5.20) is not equal to zero, «dark spots» are formed on the star’s surface, through which there is a «dump» of superfluous pressure of the gas-plasma mix. The system of automatic pressure control is activated. The scientists document the quantity of spots on the Sun’s surface of, but for the information about the star’s state, it is necessary to know not only the quantity of these spots, but also the sum of their areas. – There are some attributes specifying that the thermonuclear synthesis with energy allocation occurs not in the star’s kernel, but in the top layers of its atmosphere. 1. The power analysis of synthesis of atoms kernels in a star, states that energy allocation is possible at the synthesis of easy kernels that placed higher than the heavy ones. At the synthesis of heavy and super heavy kernels, energy is being absorbed. This fact states that the allocation of energy in a star occurs in the top layers, and in the bottom layers, in the star’s kernel, there is absorption of energy and accumulation of heavy and over heavy atoms. 2. Radiated neutrino characterizes the reactions of synthesis with the energy allocation. Allocation of neutrino occurs in the Sun areas, where a synthesis with energy allocation is carried out. The periodicity of neutrino stream change corresponds to 27 days, which is corresponds to the period of the Sun rotating around its axis. But this time cycle of 27 days corresponds to the movement of external layers of the Sun. The kernel rotates with greater speed, and if the energy allocation would occur in the star’s kernel, the periodicity of neutrino stream change would correspond to the rotation periodicity of the star’s kernel. Since the periodicity of neutrino stream change corresponds to the rotation period of the external layers of the Sun. Hence, most of the synthesis energy is allocated in the external layers, and not in the kernel. 3. The analysis of interzonal map of the Sun, (figure № R-5.4), on the neutrino radiation states about the presence of thermonuclear synthesis with energy allocation in the external layers of the Sun, in the gas-plasma mix and around the kernel, but in the kernel there is no energy allocated. 4. The high speed and the chemical compound of «the solar wind» confirm the fact of nuclear reactions existence in the top layers of the Sun’s atmosphere. The design of a star is ingeniously simple and ingeniously rational; there is nothing unnecessary and useless. If we shall look at a star as on a nuclear reactor, from the point of view of an engineer, we may come to only one conclusion «God, How Great Thou Art!». The mankind approaches to such level of knowledge of the world around, that he begin to understand that this world is created by a superior mind. We have approached to the knowledge level of Our God, through His creations! The star is a thermonuclear reactor which in the beginning of life consists only from the fuel collected in one place, and under the action of dynamic processes, this fuel turns into nuclear installation, whose case is not rigid, into «the active zone» and into the system of automatic pressure control, all in a one design. The problem of recycling of slags is solved in ingeniously simple way. The kernels and the atoms which aren’t participated in the energy manufacture, are gathering in the center of the star, in the kernel, due to the gravity of their weight, and that clears the gas-plasma mix of these «slags» and there is the fullest use as possible («full burning out») of the fuel. In uranium reactors the system of clearing the «fuel» from slags does not exist, which leads to its low «burning out» (use), with complex subsequent processing. The stars kernel, is appear to work simultaneously as a slags recycling, and a system of selecting part of the energy allocated which collected (accumulated) in the form of heavy atoms in «the white dwarf». During all the life of a star, occur nuclear and thermodynamic processes. Through all of this time, the parameters of the star change. While managing the nuclear processes is still a riddle for us, the thermodynamic processes occurring in a star can already be analyzed by us. Since one of the conditions of star existence is the observance of equality (5.1) the change in the parameters of one addendum in the formulas (5.1) supposed to lead to a change of other addendum parameters of this formula, thus under the condition of equality preservation (5.1). Such interconnected change of the parameters in a star shall be called the «self-regulation of the processes occurring in a star». Let’s consider an example of self-regulation of processes, during the change of parameters in addendum Fp, and the influence of these changes on the parameters of addendum Fiz. The heating of the gas-plasma mix during the thermonuclear synthesis leads to an increase of pressure in the mix. Addendum Fp increases. At the excess of the critical values, occurs a break of «the active zone» and part of the gas-plasma mix is pulled out into space through the «dark spots» on the star’s surface. This break influences the changes of parameters of the equality addendum (5.1).